COLUMBUS, OHIO (July 31, 2018) – The U.S. Dept. of Commerce Minority Business Development Agency says data “clearly shows” the large impact U.S. Latino business owners have on the economy. Scriptel Corporation is taking note. Some 1.74 Million U.S. business owners are native-born or immigrant Latinos. Their combined yearly income, the MBDA found, totals roughly $61.3 Billion. 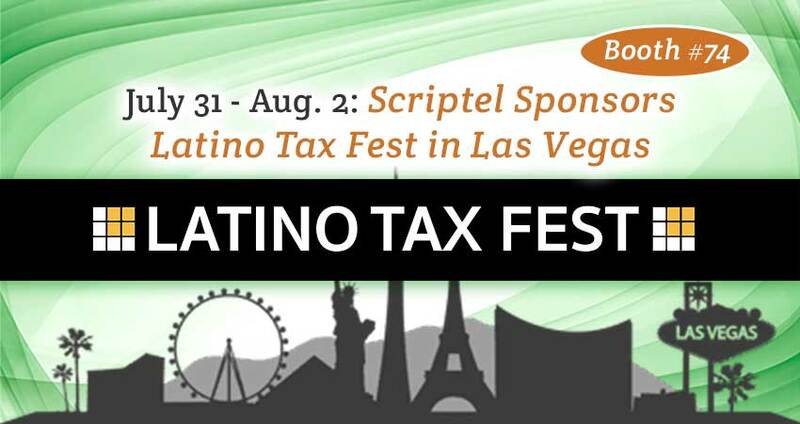 Members of the Latino Tax Professionals Association—some of whom will be at the MGM Grand, in Las Vegas, July 31 thru Aug. 2 for Latino Tax Fest—help them account for those numbers. Also hosted by Xero, Paychex, and Canon, the event is said to be the largest gathering of tax professionals and accountants who serve the Latino market. Each year 2,000-plus LTPA members join forces in Vegas for tax updates, training, networking and fun. Scriptel—the world leader in digitizing and eSignature technology—is a Sponsor. The LTPA is a professional trade organization supporting excellence in tax preparation and other services aimed at the Spanish-speaking taxpayer. Its members work in all areas of tax practice and include: individual practitioners, accounting and bookkeeping service firms, enrolled agents, certified public accountants, and immigration attorneys. Tax preparers, CPAs and other tax pros who are unable to make it to Vegas can visit LatinoTaxPro.org for details on: membership benefits, continuing education (including bilingual options), testing programs, self-guided study, and special events like this one. Scriptel is proud to partner with Latino clients from all corners. Founded in 1982, the company continually improves the way it does business to offer Industry Best service and support for a range of industries. With more than 3 Million USB-interface capacitive touchscreens and signature pads deployed worldwide, it offers something for everyone. In fact, Pew Research Center data shows, the U.S. Latino population reached 57.5 Million by 2016 and is a “principal driver of U.S. demographic growth,” accounting for 50 percent of the nation’s population growth since 2000. Indeed, the number of individuals migrating to mainland U.S. from Puerto Rico and Latin America is still climbing. Visit Booth #74, email Sales@Scriptel.com or visit Scriptel.com to learn more.